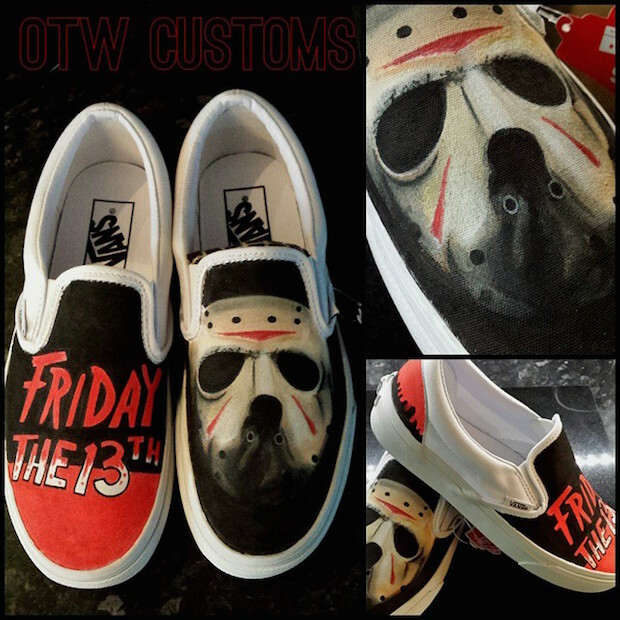 You have 9 months to the day to get a pair of Friday The 13th custom shoes for the series’ thirteenth rendition. In total, the Friday The 13th film franchise ranks around the top 5 in the horror category with a box office gross just above $380 million. With the first film released in 1980, the following eleven continued the story a boy named Jason Vorhees who drowned at Camp Crystal Lake as a result of poor supervision of the camp’s staff. As Jason was the killer or a reason for killings in the series, his iconic hockey mask became one of the most recognizable character identities of modern times. Because of solid impact in popular culture, the franchise and character have made for an often used theme in sneaker customization. The list on these two pages shows a variety of above average Friday the 13th custom sneakers by various artists dating back as far as 2008. The description above each pair has a link to the artist’s website or social media. None of these are for sale by PaintOrThread.com. This is simply a list of what we deem quality artwork in our genre of customized sneakers that deserve to be saved, shared and as inspiration. These Nike Blazers were made up as one of the earliest Jason Vorhees and Friday the 13th themed customizations. Against a bloody covered white leather, a machete-wielding silhouette of Jason and a close up on the hockey mask were painted by Mache Customs 2006. Another early design is seen on the Air Force 1 mid with comic-book like detailed Jason graphics at Camp Crystal Lake by Uneek Designs, 2010. Details on details make this Air Jordan VI retro one of the best Friday The 13th custom shoes. Made with the dark forest trees, murderous metal, dripping blood, and white plastic of a hockey mask covering the upper. Taken even further, the heel Air Jordan Jumpman logo is now Jason showing off his latest victim and machete. Painted by El Cappy 2012. Two horrors in one pair of custom painted Vans Slip-ons with Jason on the right and Michael Myers on the left. The heel tabs match with the Camp Crystal Lake sign and young Mike Myers clown mask. Painted by Sink or Swim Kicks, 2013. Jason is brought into the 2010’s in this pair of Lebron 9 customs. No stranger to the theme, Mache Customs took the Air Max soled high top to a forest of dark colors with airbrushed details of trees across the upper with specks of blood splatter across the Nike Swooshes. A look from behind sees elements of the sneakers panels morphed into aspects of Jason’s hockey mask. 2013. This base shoe was a Nike Dunk SB painted in color blocking of the Nike Dunk SB high that garnered the nickname of the Vorhees Dunk for its red, black and white color blocking. But mimicking a colorway wasn’t enough as customizer Sab One recreated the look of Eminem’s Vorhees tribute from the Shaxy XV album cover, 2014. Below a sneaker from Nike Basketball’s glory years was the base of this Friday The 13th theme. A svelte Nike Air Flightposite received one of the more realistic renditions the Jason silhouette and hockey mask against a dark forest courtesy of sneaker customizer SWBartwear, 2014. Vans Slip-ons direct and to the point with the iconic hockey mask and movie poster lettering by OTW Customs, 2014. Nike Foamposites were the victim of this Jason Vorhees centered murky customization painted by Kreative Custom Kicks, 2015. Click Next to see the rest on page 2!